Is Money Ruining College Football? 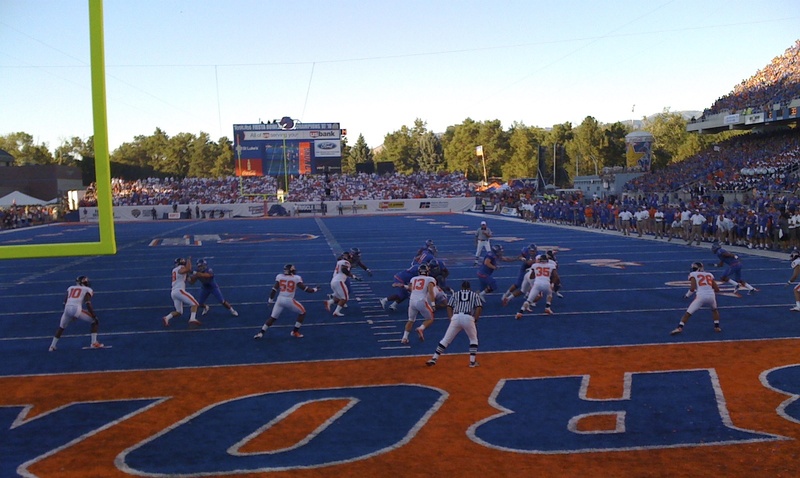 With my brother, watching his Alma Mater play a couple of years ago in Boise, Idaho. I stayed up until near midnight last night only to watch my beloved Ducks come up just short on their final drive and lose by three points to a very good Michigan State football team. As the Spartans were beginning their victory celebration, 1500 miles away in Utah, Boise State and BYU hadn’t even reached halftime. In fact there were no fewer than 20 nationally televised games yesterday, perhaps double that number when you add in premium channels like the Big Ten, Pac 12, and SEC networks, and still more games broadcast locally. I will readily admit that I am dating myself when I say that I remember a time when I was only able to watch an Oregon game on national television perhaps once a year. And my other Alma Mater, Fresno State, rarely attracted any attention outside California’s Central Valley. Now, all I have to do is go online to see when and how to watch my favorite teams play without ever leaving the comfort of my living room. But is this increase in viewing opportunities worth the changes it has brought about in the nature of college football? College football began almost 150 years ago as a way for students from mostly neighboring colleges to challenge each other and as a diversion from the seriousness of their college studies. To have fun and work off some excess energy. Almost from the start there were cheerleaders (primarily male for many years) and fans who often brought picnic lunches to the game, which they spread out on the sides of the fields and later in the stands that were set up for the growing crowds. Eventually, the games became increasingly competitive so that some colleges began to “recruit” skilled athletes, not necessarily students, to their schools to improve their chances of winning. By 1950, the NCAA had formally developed and approved the athletic scholarship which allowed colleges and universities to pay tuition, room, board, books and fees. Today between the cost of scholarships and the new “cost of attendance” stipends, upgraded luxury facilities that can cost tens of millions of dollars, coach’s salaries which can be exponentially more than that of the university president, travel and the other miscellaneous operating costs, most Division 1 schools (and conferences) rely heavily on the money generated by broadcast agreements. Some are fortunate to have wealthy alumni or fans to help to offset the costs of maintaining a competitive program. But with all this money involved have these powerhouse football schools lost sight of their primary purpose of educating young people and preparing them to be come successful members of society at large? Have they become simply a conduit to train, develop and sort out players for professional football at little or no cost to the NFL, CFL or Arena Football League? Cardale Jones, the quarterback of National Champion Ohio State, used his twitter account to express an idea that many are starting to believe but most don’t talk about, “Why should we have to go to class if we came here to play football, we ain’t come to play school, classes are POINTLESS”. More than 50% of college players believe they will likely make it to the next level when in reality less than 2% actually will. And even if they somehow are able to become part of that 2%, the average NFL career is less than four years. The universities are doing these young athletes a disservice if they fail to prepare all their players for life after football. While I look forward to the start of a new college football season, my enthusiasm is a tempered by my concerns over the influence of money. I’m afraid there is no putting the genie back in the bottle, but I would hope that some of this unbridled spending will be slowed and that college football will recognize the benefit of sharing the wealth. After all, it will be difficult to maintain interest if there are just a handful of schools that can really compete on the field or in life. This entry was tagged athletes, broadcast agreement, College football, cost of attendance, division 1 football, Ducks, education, Money, NCAA, Ohio State, scholarships. Bookmark the permalink.